Under Fisher DeBerry, seen here in 2004, Air Force captured 14 Commander-in-Chief's Trophies. 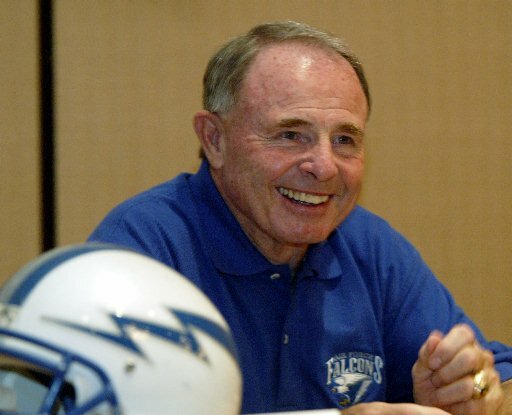 Congratulations to longtime Air Force coach Fisher DeBerry, who has been elected to the College Football Hall of Fame. DeBerry turned Air Force into a consistent winner during his 23-year tenure, taking the Falcons to 12 bowl games. His squads had just six losing seasons, and DeBerry retired in 2006 with a 169-109-1 overall record. Most important, though, was DeBerry’s dominance over service academy rivals Army and Navy. He was 35-11 against Army and Navy, and his Falcon squads won 14 Commander-in-Chief’s Trophies. Joining DeBerry in this year’s hall of fame class is former Michigan coach Lloyd Carr and a stacked list of former players, including Eddie George, Deion Sanders, Russell Maryland, Jake Scott and Will Shields.